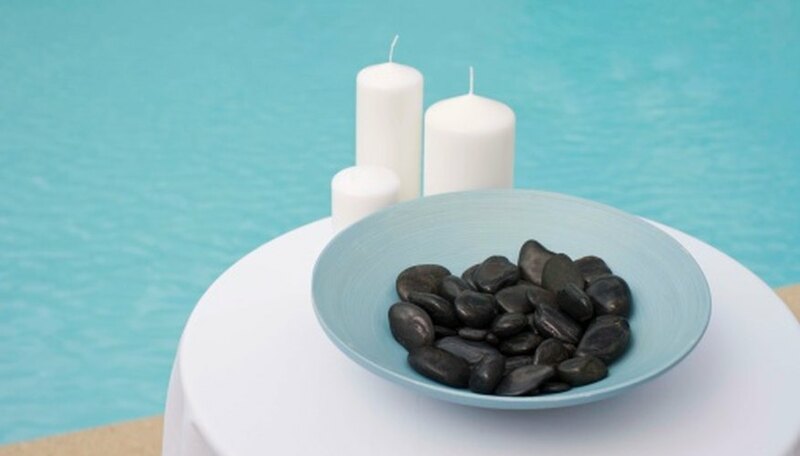 Those wanting to smooth stones and pebbles can transform jagged rocks into polished works of art with the help of an electric rock tumbler. All it takes is some grit, water and a few weeks' worth of patience. When the process is finished, the smooth stones and pebbles make great decorations that can even be made into one-of-a-kind jewelry. Clean the barrel of your rock tumbler and all the stones and pebbles before beginning the tumbling process. Remove all grit in the barrel and loose dirt and debris from the rocks by running them under water. According to the Rockpick Legend Company, "preventing contaminants from entering the process" yields a fine rock polish, so this cleaning stage is very important. Fill your rock tumbler barrel to about three-quarters full with small rocks and pebbles. Take time to make sure you've filled it properly, as an unbalanced tumbler will lengthen the polishing time. Add water to the barrel. Filling it to just below the top of the rocks. Add four tablespoons of the Step 1 grit, which is sand-sized particles of silicon carbide. This abrasive material is much harder than rock. When tumbled together, the grit will etch tiny scratches into the pebbles and stones and eventually smooth them out. Close the tumbler barrel. Turn on the machine and let it run for five to seven days. Take out the rocks and grit. Wash everything, including the barrel and the rocks. Be careful not to pour the grit down the drain, as it may clog it. A rinse outside will not hurt your grass, plants or pets. Place the stones and pebbles back in the barrel. Add water to the barrel, filling it to just below the top of the rocks. Add four tablespoons of the Step 2 grit. Close the barrel and let the machine run for another five to seven days. When the cycle is over, once again take everything out and wash the rocks. Repeat the Step 2 process, but this time add six tablespoons of Step 3 grit into the barrel. Let it run for five to seven days. Remove the rocks and clean the rocks and tumbler barrel. Put the stones and pebbles back into the barrel. At this point, the rocks that once filled three-quarters of the barrel now only fill about half of it. This is because they are being worn down and polished. Add water to the barrel, once again filling it just below the top of the rocks. Add plastic pellets to the barrel until it's about three-quarters full. Add six tablespoons of the Step 4 grit. Seal the barrel and turn it on for another five to seven days. Take everything out at the end of the cycle and wash it. 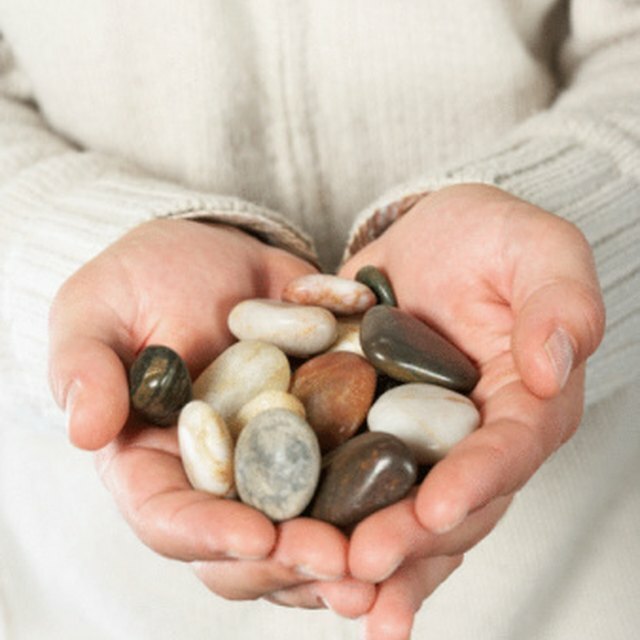 Your pebbles and stones should have become very shiny and smooth. If you want to make your rocks even more polished after the Step 4 process, put the stones and pebbles back into the barrel. Fill it with water to just below the top of the rocks and add two tablespoons of dish soap flakes into the barrel. Close the tumbler and let it run for another two to four hours. Wash them off and enjoy. Freeman, Sarah. "How to smooth pebbles and stones." Sciencing, https://sciencing.com/smooth-pebbles-stones-7981981.html. 25 April 2017.